Where has the time gone? In just a few short weeks, we will be celebrating your FIRST birthday! You light up our world baby girl I truly can’t imagine our life without your giggles. I haven’t stayed on top of your monthly post, but I have been keeping up with all of your growth over the last few months. Instead of saying “third child problems,” let’s say we’ve been too busy soaking you up! Our biggest news is that you started crawling this month (March 20). I forget how that changes EVERYTHING. You are all over the place and chasing down Chickadee and Sprout so that you can join in their fun! You also are able to go from crawling to sitting to crawling again. You love waving and giving high 5 making you very social with all those that you meet. Two more teeth came in (one on the top and one on the bottom) which gives you 8 teeth. A mouthful for sure. I think we’ll move into almost all finger foods and kiss purees goodbye. I think this month brought our first real hiccup! You started waking up at night again. However, I enjoyed the snuggles and quiet time and you were back to sleeping through the night after a few weeks. At your 9 month appointment you were 17 pounds and 27.5 inches long, right at the 50% in both. You are wearing 9 month clothes and size 3 diapers. You are also still nursing 4x a day along with a small breakfast, lunch, and dinner! 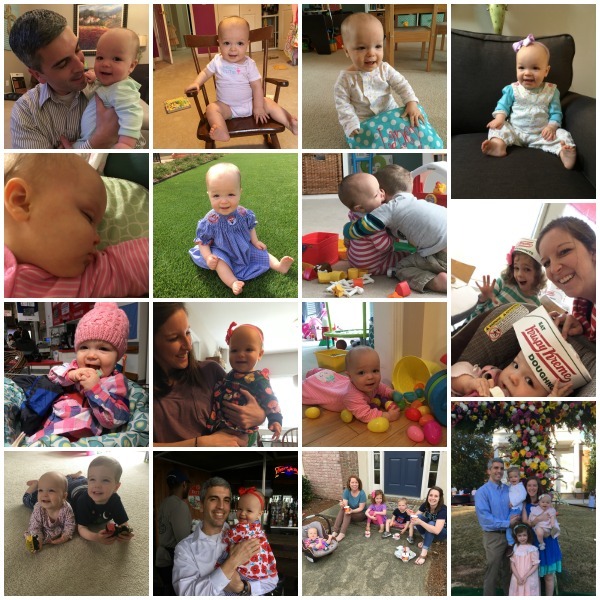 We celebrated your first Easter this month and you tagged along to a couple of Easter egg hunts and read lots of stories about our RISEN Savior. Bebe, Pop, Aunt Rachel and Uncle Zac came to celebrate with us and you enjoyed the extra love and snuggles. We also traveled to Alabama and you slept through your first 5K. We went to support Gertrude (your Ugandan sister!) and Sozo Children. 10 months. I think you are a fan of this milestone. You are one HAPPY baby who always welcomes everyone with a smile. Every night after saying your prayers we pray that you will love other like Jesus and although you are still a tiny little nugget, your love radiates from your smile and shine through your eyes. I pray this is always the case. Your JOY is contagious. Speaking of nighttime, you love your bedtime routine. For both naptime and bedtime we turn on the white noise, turn off the light and begin to sing to you. You always rest on our shoulder for just a second before reaching toward your crib where you roll over to your tummy immediately and snuggle in to go to sleep. You don’t make a peep and in a few minutes are out like a light. You are starting to pull up to your knees while in your crib and we definitely need to make lowering your mattress a priority! I absolutely love when you pull and sit on your knees, it’s the absolute cutest. You are eating mostly finger foods now and LOVE meat. We often call you our little carnivore. You will seriously bypass the strawberries and go for the shredded chicken. Needless to say you are a fan of Chick-fil-a like the rest of us! You still love the occasional pouch, and the Choo-mee pouch tops are awesome because you can eat the pouches by yourself without making any spills. We headed north this month to Chattanooga to take your brother to ride Thomas the train. You were such a trooper, napping in the stroller and in the car as we carted you all over the city. We made one stop at a playground and you confirmed your love for swinging. You also rode a carousel, strolled across the pedestrian bridge, tried your first little bit of ice cream, stayed in an AirB&B, and of course took a ride on Thomas the train. I think we’ll head to Chattanooga again, it was so much fun! 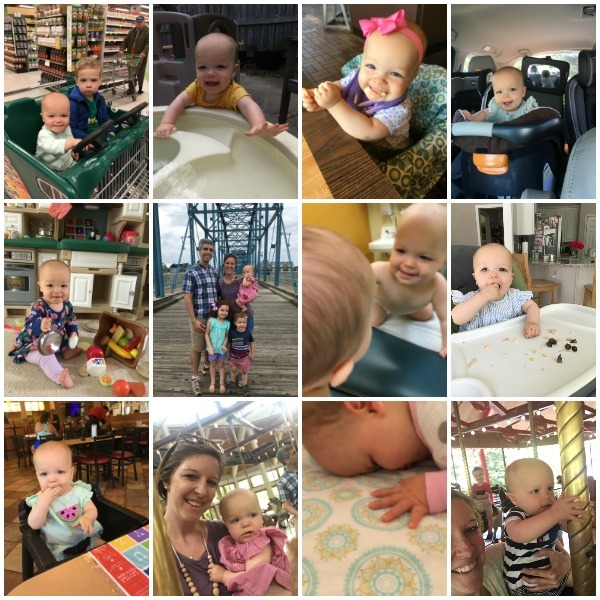 I can’t believe this is our last monthly post before you are ONE! How can that even be??? It is definitely bittersweet. The baby stage is such a sweet time and you made it so easy and enjoyable! But we look forward to watching you continue to grow and meet milestones as you take toddlerhood by storm! You are still in size 3 diapers and wearing 9 and 12 month clothes. You sleep through the night like a champ and nap around 9:00 and 1:00 each day. You are crawling and have begun pulling up on everything. You are solidly in the stage though that once you pull up you struggle to sit back down and so just scream until someone helps you! You are eating everything we put in front of you, which means I am happy to be down to just cooking one meal for everyone. You still prefer meat, but you seriously don’t turn anything down. You love snacks in your snack cup and often stuff too much in your mouth. You also have started drinking (or maybe guzzling) from a 360 cup. I’ve started supplementing you a little here and there with formula and you took it like a champ. You continue to babble, scream, and coo constantly. 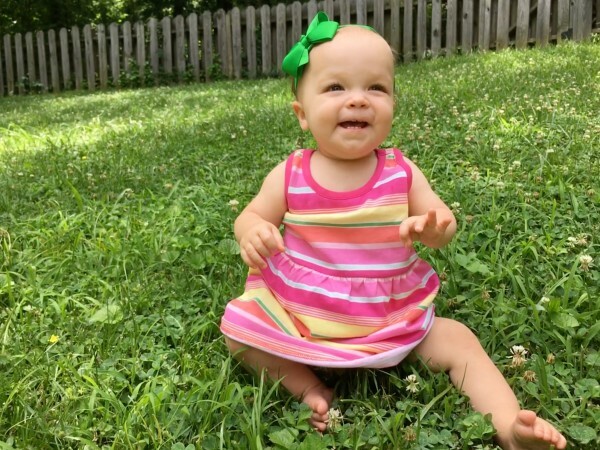 Your sounds often sound like mama, daddy, bye bye, and hi….but they are not consistent enough for me to give you credit :) Your waving makes you a friend to everyone and you’ve started giving kisses and mimicking raspberries too. We were on the go this month again. 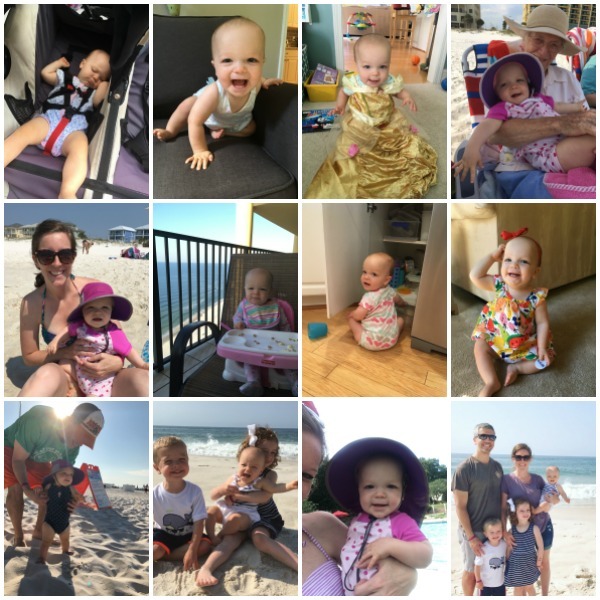 We started with your first trip to the beach over Mother’s Day. You weren’t the biggest fan of the sand or the ocean on day one, but by the second day you had warmed up to it a little bit and would at least sit in the sand and let the last little bit of the breaking waves come over you. We attended a lot of events for Chickadee and Sprout as they wrapped up preschool. And then we rocked VBS at Peachtree where you were an absolute champ with my crazy schedule and holding it all together as you spent a lot of time in the nursery. Ms. Deborah loved on you and helped you make the sweetest VBS crafts reminding you that God gives you everything you need! And now we are down to one month. 31 short days until you are ONE. God blew us away by giving us you to love and care for. It is hard to imagine life before you came along, us as a family of 5 just seems right right now. Thank you for loving us so well sweet girl. We pray your heart is always open to love freely and that God’s love is evident in your every action. We love you big girl!